I love audio books. LOVE THEM. I discovered them a few years ago when I was spending a ridiculous amount of time in the car, and have enjoyed many books that way. I found that I get more out of them, actually, because I tend to skim when I read, and audiobooks don't let me do that. Under Drake's Flag is a book by G.A. Henty, a name well-known among homeschoolers for his historical adventure stories. Heirloom Audio Productions has a fabulous audio drama retelling of the book available, and I was excited to receive a copy to review. It's intended for ages 6 and up, so my whole family could listen. The dramatized story is 2 hours long, and lots of fun. Each chapter is numbered on the CDs, so you can easily play a chapter at a time and find where you left off. I haven't read the actual book yet, but now I want to! What a great story! If you haven't read it, either, it's the story of Ned Hackshaw, a fictional boy who served under Sir Francis Drake. Once aboard Drake's ship, he meets another boy, Gerald, and they have lots of adventures together. They are set adrift in a painter's boat, rescue a girl from a shark, help plunder a Spanish town, get separated from the ship in a hurricane, and experience the Spanish Inquisition first hand. They endure extreme trials of faith, and it's painful to hear their struggles, but beautiful to see how God is faithful to them. You might recognize the voice of actor Brian Blessed, who plays the narrator, Mr George. The CD liner insert is a study guide booklet. I also received a PDF copy of the 30-page study guide, which is an expanded version of what is in the CD liner insert. There are three sections for each chapter: Listening Well, which asks questions that make sure you were listening; Thinking Further, which includes questions that ask you to give you thoughts about what you've heard, and Defining Words, which presents vocabulary words you should know. In general, I don't use study guides for books, because I want my children to narrate what they hear and make their own connections with the story. However, there are some good, thought-provoking questions in there, and I could see some interesting discussions coming out of them. I have to be honest: I was not sure how I would feel about a dramatized audio book. My family and I generally prefer audio books minus the dramatization, but this one is outstanding. It's so good, that when my kids and I started listening to it in the car, I sat outside and finished listening to it while they were at various activities, and they are going to have to finish the story another time. It's a perfect book to go along with our studies of the Renaissance and Reformation this year, as we will be covering exploration. I'm excited to pop it back in when we get that point in history. My children all like audio books, so this will be a fun addition. 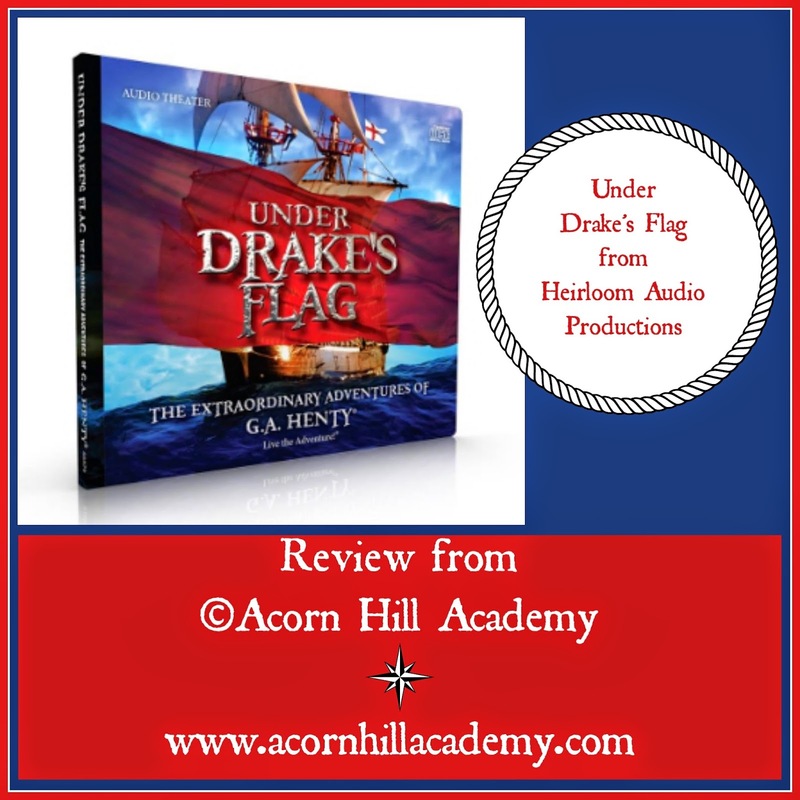 Under Drake's Flag is available to order directly from the website. There are two options for ordering. You may choose an instant MP3 download for $20, or the 2-disc hard copy version for $29.95. Both options come with nice bonuses, so be sure to check them out. And the best part? There will be a version of In Freedom's Cause coming out in November! Check out the Facebook page to see if you recognize and of the folks providing the voices. I can't wait! Connect with Under Drake's Flag on Facebook!